When clicking on a hyperlink (either http:// or https://) in Microsoft Outlook, the following error message may be prompted instead of directly opening the linked web page in operating system default web browser. Something unexpected went wrong with this URL: “<hyperlink>”. The system cannot find the file specified. Something unexpected went wrong with this URL: “<hyperlink>”. Application not found. Something unexpected went wrong with this URL: “<hyperlink>”. Class not registered. The issue is likely caused by corruption or conflict of default web browser setting on Windows operating system especially on system that has multiple web browser. In other words, the default web browser, such as Edge, Chrome or Internet Explorer, is not set as default browser properly. The issues can happen in many versions of Microsoft Office Outlook, including Outlook 2016 and Outlook 2013, and in many operating systems such as Windows 10 and Windows 7. To resolve the issue, try to reset the default web browser, either by setting a new web browser as default web browser (or if your preferred web browser already the default, to another web browser temporarily before switching back, or reset the default program for .htm and .html file extensions, and HTTP (URL:HyperText Transfer Protocol) and HTTPS (URL:HyperText Transfer Protocol with Privacy) to your preferred web browser or another web browser. Go to Apps -> Default apps. Click on the row below Web browser, and choose an app as a web browser. 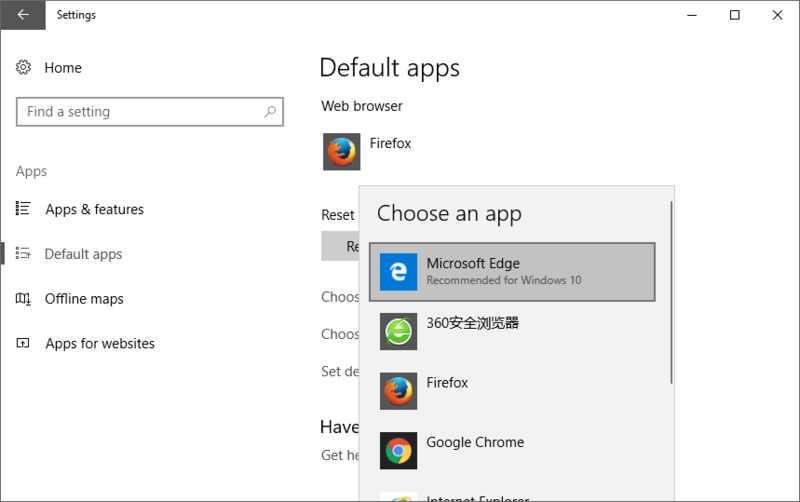 There are multiple ways to set a web browser as default app in non-Windows 10 operating system. One way is from Options or Settings inside the web browser itself. Another option is to set the default programs through Control Panel. Open Control Panel -> Programs -> Default Programs -> Set Default Programs. Choose a web browser and select Set this program as default. It’s also possible to set your favorite web browser to handle just HTTP and HTTPS protocols, and HTM and HTML file types by default. Once the default web browser is reset, try to click or tap on the hyper-links in the emails in Outlook again, and it should automatically open in the default web browser.